The group, representing Christian, Muslim, Taiwanese, and Tibetan communities in China, came together for an event at the Heritage Foundation titled, "Evaluating Threats to Religious Freedom in China." Walter Lohman, director of the think tank's Asian Studies Center, moderated the event, during which each panelist described a drastic increase in persecution by the Chinese Communist Party since last year. Dr. Bob "Xiqiu" Fu, the president and founder of ChinaAid, described 2018 as a disastrous year for Chinese civil rights. According to Fu, it marked the "worst year for human rights, freedom of press, freedom of association" since 1967 and the Cultural Revolution. Despite Article 36 of the Chinese constitution guaranteeing religious liberty, the law restricts "hosting large-scale religious activities" or "distributing religious materials." Children, military members, and Communist Party members may not attend religious services. In 2018, ChinaAid documented 10,000 individual cases of state persecution against Christians, Fu said, a 36-fold increase from 2017. Fu described thousands of church closings and government-run facial monitoring inside churches. In 2014, the government ordered the destruction of dozens of churches. In 2015, the Chinese government removed over a thousand crosses from the tops of the churches, prompting outcry. Just last year, state officers collected and burned Bibles in the brutal style of Mao Jiang Qin in the 1960s. In August 2018, the Associated Press reported on China's Xi Jinping's five-year plan to "Sinicize" Christian churches. The AP report described the Chinese religious affairs department declaring that "only Sinicized churches can obtain God’s love." Fu described Chinese government officials removing statues of Jesus and installing portraits of Chinese leaders. There is "an effort underway to translate the Bible compatible with socialism," he confirmed. In January, the government ordered a Henan province church to remove the first commandment from their copy of the Ten Commandments. The First Commandment, found in the Bible, commands, "You shall have no other gods before me." Fu compared this forcible process of "Sinicization" to the Nazification of the 20th century. In the 1930s, before the Holocaust reached its height, the German government forced churches and other cultural institutions to adopt Nazi party symbols, messages, and regulations. German churches were told to depict Jesus as militant, discard the Old Testament, and bar Christians of Jewish ancestry. Nury Turkel, chairman of the Uyghur Human Rights Project, shared many of Fu's concerns. Turkel extended them to the Uighur community, a population of several million Chinese Muslims. 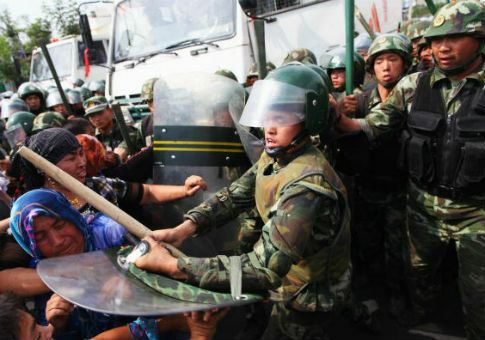 The Chinese government has imprisoned as many as one million Uighurs in camps. Xi has "determined to stamp out Uighur identity entirely," Turkel warned. The Chinese government introduced the Uighur camps in the spring of 2017. The Chinese government undertook a project of "de-extremification measures" to crack down on the vulnerable population. It called Uighur Islam a "mental illness" and described headscarves and beards as signs of extremism. The "international community is only beginning to realize the scale and magnitude" of the religious crackdown, Turkel warned. In February 2018, Reuters used satellite imagery to identify 80 Uighur camps, describing them as "gulags." According to one Australian think tank, the facilities they observed expanded by 465 percent over two years. New prisons were under construction outside Urumqi, a major Uighur city. China's ambassador to the United States defended the camps in a Reuters interview as an effort to rehabilitate Uighurs. The camps seek to "turn them into normal persons [who] can go back to normal life," he said. Turkel described the Uighurs as the "canary in a coal mine." Echoing Fu's clear references to the German-perpetrated Holocaust, he called it the beginning of another "regrettable chapter … in history." Dr. Sen-Hong Yang, president of the Taiwan Association for China Human Rights, warned that only international pressure could protect the many minorities at risk in China. "Over the past decade, over 150 Buddhist monks have lit themselves on fire to protest China's repression of their beliefs and culture," he said. China exerts its influence through think tanks, campus Confucius Institutes, and journalists, he warned. Yang praised the administration's response. In October, Vice President Mike Pence delivered a keynote speech at the Hudson Institute, laying out the differences between the Chinese and American visions for global order and prosperity. "Beijing is employing a whole-of-government approach, using political, economic, and military tools, as well as propaganda, to advance its influence and benefit its interests in the United States," he said. Matteo Mecacci, president of the International Campaign for Tibet, agreed. He argued that China "won't be deterred by statement, only action." He pointed to China's shameless defiance and abuse of international standards and institutions, whether via Interpol, the Dalai Lama's successor, or Huawei. The panelists gave credit to Trump administration for allowing the State Department to block U.S. access to Chinese officials behind the anti-Uighur policy. The Chinese government "showed in August it will react to international pressure," Turkel said. We "need to name and shame." Sen. Marco Rubio (R., Fla.) and Rep. Christopher Smith (R., N.J.), who co-chair the Congressional-Executive Commission on China, condemned the "unconscionable" persecution of religious minorities in China during an October press conference. Their annual report stresses the unprecedented million-man scale of Chinese repression against civil liberties. They described it as the "largest incarceration of an ethnic minority population since World War II, and that it may constitute crimes against humanity." This entry was posted in Issues and tagged China, Christopher Smith, Heritage Foundation, Human Rights, Marco Rubio, Religious Freedom. Bookmark the permalink.